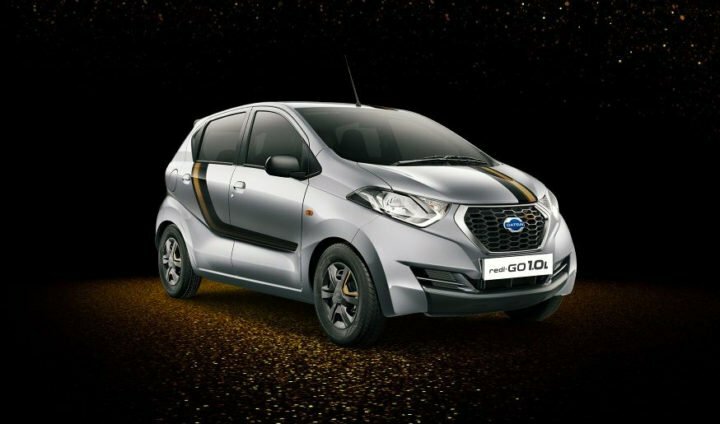 Datsun redi Go 1.0 Gold Edition Launched! Datsun India, the Indians subsidiary of the resurrected Japanese carmaker, has come up with a new Gold Edition of its Redi GO hatchback. The new 2017 Datsun redi Go 1.0 Gold Edition has been strategically launched right at the onset of this year’s festive season. The latest special edition model should help the car enhance its sales performance during this year’s festive period. This limited edition is based on the T(O) trim. It has a starting price of Rs 3,69,737 (ex-showroom). The new Gold Edition offers a handful of new features that work together to enhance the appeal of this entry-level hatchback. There are no changes in the specifications and mileage. The exterior of the new redi Go 1.0 Gold special edition comes with unique gold-inspired decals. The interior gets complimenting gold-themed seats. The biggest highlight, however, is the first-in-segment Ambient Lighting app for a customer to choose the mood lighting of the cabin to suit his or her taste. Thr new car has gone on sale in three body colours: Grey, Silver and White. As this special edition builds up on the T(O) trim, it gets some premium features like bluetooth audio system, reverse parking sensors, etc. Powering the Gold Edition of the new Redi Go 1000cc model is a 1.0 litre, 3-cylinder Petrol engine that offers a maximum power of 67 BHP and a peak torque of 91 Nm. The engine comes mated to a 5-speed Manual Transmission.This bargain basement hatchback is underpinned by the Renault-Nissan group’s CMF modular platform. The engine has an ARAI-tested fuel mileage of 22.5 KMPL. Read on for full details on the new 2017 Datsun Redi Go 1.0 Gold Edition. 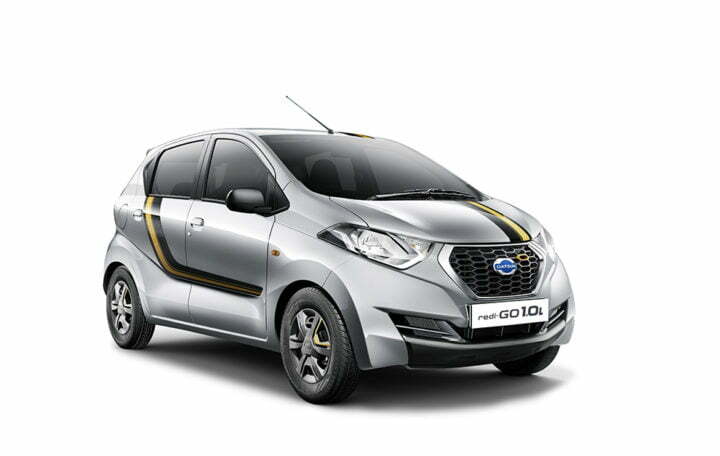 The new Datsun redi Go 1.0 Gold Edition has gone on sale at an ex-showroom starting price of Rs 3,69,737. The new model is available throughout all official Nissan-Datsun showrooms across the country. The latest special edition follows the Sport limited edition of the Redi Go that was launched earlier. Datsun redi-GO GOLD customers can also avail of the “Datsun CARE” comprehensive service package. Datsun CARE is an industry-leading all-inclusive car service package that offers peace of mind to customers. Three, four and five-year options are available wherein customers can save approximately 10% on periodic and general repairs. The latest special edition of the Redi Go 1.0 doesn’t get any mechanical changes. This means there is absolutely no change in the specifications. Powering the new Gold Edition is the same 1.0-litre engine that powers the regular 1000cc version of this entry-level hatchback. This engine outputs a maximum power of 67 BHP along with a peak torque of 91 Nm. The engine comes mated to a five-speed manual transmission. The Redi Go commenced its Indian innings with a 799cc, 3-cylinder, petrol engine that has a max. power of 53 BHP and a peak torque of 72 Nm. The RediGo 1.0 is built on the CMF-A architecture from the Renault Nissan group. The new 1000cc model doesn’t get any changes to its suspension. As there is no change in the specs, even the mileage remains exactly the same. The redi Go 1000cc engine variant boasts an ARAI-tested mileage figure of 22.5 KMPL. This makes the 1.0-litre version merely 0.2 KMPL less fuel efficient than its 0.8-litre sibling. This car has a fuel tank capacity of 28-litres. The latest special edition of the budget-end hatchback is based on the T(O) trim. This means it gets all the bells and whistles that the top-end model of the redi GO offers. Other than this, it also gets a handful of styling updates that make the car more attractive than its regular version. The exterior gets unique gold-inspired decals. Complementing the graphics are the gold themed seat covers. The major highlight is the first-in-class ambient Lighting app for a customer to choose the mood lighting of the cabin to suit his or her taste. Thr new car has gone on sale in three body colours: Grey, Silver and White. As the latest Gold special edition is merely a cosmetic update, there is no change in the overall dimensions of the car. The redi Go isn’t too big on the outside, but thanks to its clever design, there’s enough space on the inside. A highlight of this car is the really high ground clearance of 185 mm. To put things in perspective, the Hyundai Creta has a ground clearance of 180 mm. So, what do you think of the new Datsun redi Go 1.0 Gold Edition? Do you think the latest special model of the rediGo 1000cc version will help the entry-level hatchback find more buyers during this year’s festive period? Share your views with us by penning them down in the comments section below. Stay tuned to CarBlogIndia for latest news updates on the Datsun Redi go.